Size: 6.75" x 4.5" x 4.25"
The top of this beautiful jewelry box is decorated with traditional Chinese dragon and phoenix symbols. Perfect as a gift or use it as a decoration in your home. The dragon represents the male, the yang, and the phoenix represents the female, the yin. 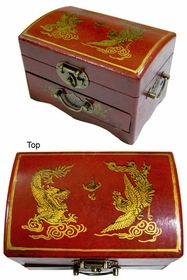 The dragon and phoenix together symbolize harmony and the happiness of marriage. The pattern of the dragon and phoenix also means auspiciousness and good luck.